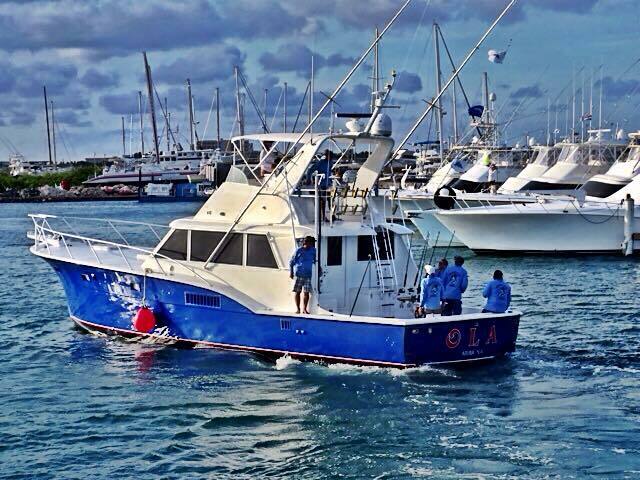 Ola is a custom 53' Hatteras, sport fishing yacht. We are located in Renaissance Marina beside beautiful downtown Oranjestad, Aruba. Our yacht is fully air conditioned, with a complete galley, and three staterooms with adjoining bathrooms. We are equipped with brand new safety and navigational equipment, which are inspected by both Aruban and United States maritime authorities. Ola has the very best in up-to date Radar, VHF radios, sounder/ depth finder and GPS navigation electronics. We also have a complete A/V system inside the spacious salon with surround sound and speakers. We invite you to bring along your favorite music, so we can play it from our bridge and cockpit. Our goal is to give you not only the most comfortable and enjoyable fishing experience, but the most memorable and exciting, as well.